Hot summer nights call for cool summer dinners! This Spinach Salad with Warm Bacon Dressing fits both of those bills, is delicious and healthy for you too! The next weekend while shopping I went straight to Borders and found the book! There are so many recipes I will be making from this book and I can’t wait to share them. It is amazing how you can cut calories by eating very similar things right at home. This salad that I made fit right into the South Beach Diet eating plan for phase 1 (which Grumpy and I are both following as of Monday). I upped the protein since it was going to be our main meal and because Grumpy has to have more substance than salad and a little bit of protein :o) He was skeptical because he’s not a big raw spinach lover but he ate it anyway (did he have a choice? he he). He actually enjoyed the salad! It was delicious and filling. Definitely a keeper! Heat large skillet ove rmedium heat. Cook the bacon until crispy, 5-7 minutes. Transfer to a paper towel on a plate and reserve. Add the onion and mushrooms to the hot pan and cook until the onions begin to brown, about 3 minutes. Season the shrimp with salt and pepper and add to the hot pan. Cook until shrimp are pink and firm, about 4 minutes. Stir the mustard and vinegar into the pan; season with salt and pepper. If the pan looks dry, add a splash of olive oil. To serve, top spinach with hot shrimp mixture and some of the liquid in the pan. Sprinkle with the bacon. **Note, the calories in my salad were not the same as the book - however they couldn't have changed a whole lot - if anything, they were probably less. I omitted pine nuts, used half the bacon. I upped the shrimp however as I used a whole pound where the recipe tells you to use only 1/2 a pound for 4 people. I wanted a main dish so I upped the protein. This looks and sounds really good Shelby. My husband and I are very big on salads lately. Might have to try this one. Thanks for sharing. My Grandma used to make spinach salad with hot bacon dressing and it was one of my favorites! Although I think she used to add a lot of sugar to the dressing … definitely not south beach! Love the balance of colours and nutrients in the platter… YUM!! I always enjoy a good spinach out. I should try making this at home! This dish makes me think of my mom. She adores hot bacon dressing. And I pretty much adore anything with the word bacon in it. That, my friend, is a seriously gorgeous salad. 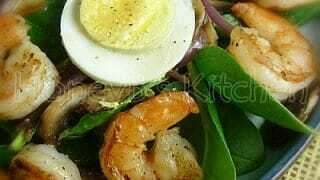 my kind of salad love the shrimp and bonus of healthy spinach lovely photo Shelby! 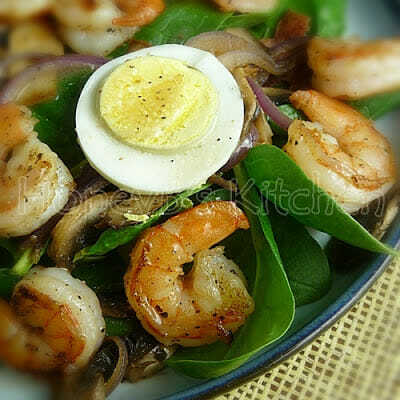 This salad looks amazing, I love the addition of shrimp in it. It makes me want to make it right now… a salad… really? I never think to add hard boiled eggs to salad when I'm at home, but I always get excited when they are on my salads at restaurants. Yay for inspirational salad toppings! Made this tonight because it sounded so good!! If anything I could of added more Dijon/vinegar because the mushrooms soaked up everything!!! The flavors were great, thanks to bacon and I added some goat cheese on top. It was wonderful! I love the look of that salad! I would totally enjoy that as my main dish! My husband adores hot bacon dressing on endive…I know he would love this salad! great salad Shelby!! I did south beach for a while, and still try to live the lifestyle (along with Sonoma Diet! )…good luck, I had lots of success with it. Its a great way to kick start everything! I'm craving this salad now! Minus the bacon dressing (since I don't do bacon anymore…wonder what I could sub?). This sounds so good! I love spinach salads. This is what I call a "total Yum". Love the sound of warm bacon dressing!! This looks really delicious, Shelby! And with the bacon dressing and shrimp in there I'm sure I could get hubby to give it a try! I've seen that book, Cook This Not That, several times and almost bought it. Now I think I'm going back to the bookstore and get a copy. You had me at warm bacon dressing – yum! nope – this salad is DEFINITELY NOT BORING!! This is my kind of salad! Shrimp, bacon, and spinach, yes please! My wife is gonna love this, she just loves seafood and veggies! just perfect for dinner! Great book great recipe and spot on wonderful photos! Hey Shelby… Just wanted to drop you a note that I LOVED THIS RECIPE. I made it last night for dinner (and already posted it on my blog… with all due credit of course). I had such a fun time going through your blog getting to know a little bit about you (and my new best friend, the Grump).